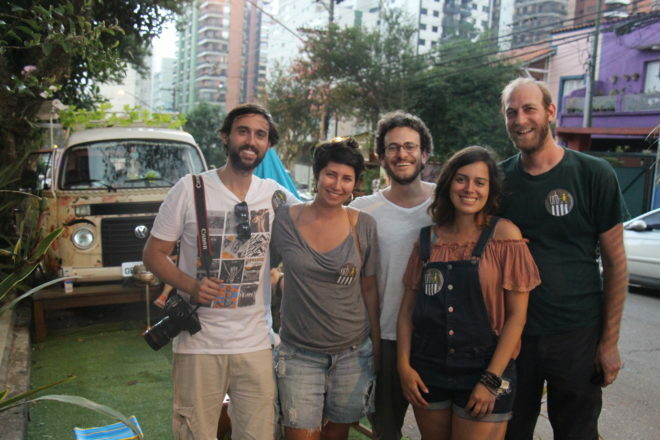 Urb-i is a multidisciplinary Brazilian placemaking startup that inspires people to see their Streets as Places. Through a remarkable crowdsourced database of before and after images from Google Street View, and Lighter Quicker Cheaper interventions of their own, they show the transformative impact that placemaking can have on communities. We sat down with co-founder Yuval Fogelson to learn more about their work. PPS: What got you interested in the quality of public places? Yuval Fogelson (YF): Urb-i was founded initially by four urban designers. 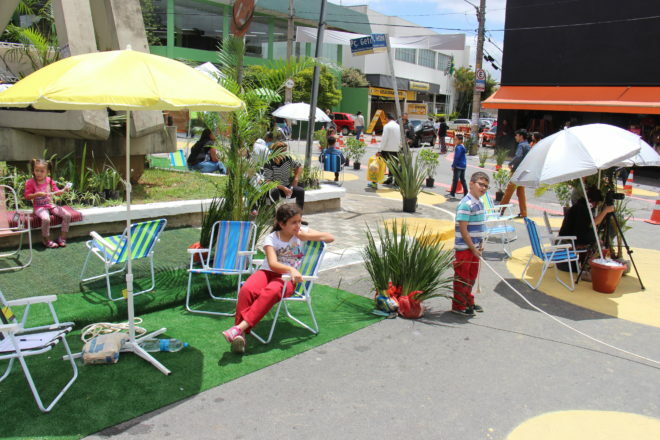 Dealing with urban projects, creating new quality public space was imperative to our projects, however we felt that we could not influence or change existing public spaces, which were relatively easy to transform into better spaces for people and not only car oriented. That is when we decided to create Urb-i. Our focus was first of all on the use and distribution of the space, considering the space designated for the automobile versus the space left for pedestrians. The actual design and qualitative aspects of the space, are very important, yet secondary. As the designated space can be improved in the future but the distribution of space may be something which will be extremely difficult to change in the future. Therefore, our focus is in inspiring these transformations—simple to execute, not requiring heavy infrastructure, but difficult to approve, as it requires a change in the status quo towards a prioritization of a people-oriented city. PPS: Why does Urb-i collect and communicate web content, as well as produce real-world projects? Urb-i acts on two fronts, virtual-global and local-real life. The virtual web-focused front aspires to inspire and connect as many people as possible, to change their perception towards the city, and influence change in their cities. This is a more light and superficial wave reaching many people, but not causing direct actions, however a few individuals (often already in the urban planning realm) may be inspired to take some concrete action. Through taking our own concrete action in the real world, we learn the difficulties encountered and the resistance met in implementing even the simplest transformations. We can reach other audiences, as well as actual users of the spaces where we experiment with interventions. The influence may be hyper local but this work enters our web content, too, where again it can inspire and reach a larger audience. PPS: What is the process for creating these before/after images of street transformations? YF: The vast majority of the images are found by myself as I research and browse through aerial photography and delve into streetview. I can say that by now it has become some sort of addiction of my own, kind of like a treasure-hunt in the world map. One of the most effective methods is the comparison of aerial photos from different years. Another is simply browsing and learning about the city. As an urban designer, this is very valuable as I can learn a lot of the structures of cities worldwide, analyzing the aerial photography, and checking it in 'human scale' through Google Street View. Of course, nothing really beats physically visiting a city and walking its streets, but I find this one of the most effective ways to learn about cities and the way they are designed. However, some of the collaborators also find locations of transformations (you can contribute to the before/after project here), and we also receive emails with locations through our website. The flow of information is not constant and usually larger when an article about our site is published in some site or journal. The before/after project is international. People from anywhere can collaborate by sending us links through the contact page, or they can become collaborators that can participate in the actual image creation. We are always happy to have more collaborators on board—from anywhere around the world—that are passionate as we are about transforming cities. PPS: Where do you see this work leading? We are working on creating a connection between the two spheres. The desire is for the virtual web based site to evolve into a collaborative platform where citizens, designers, organizations and investors can propose and discuss collaborative public space transformation projects, while using a database of before/after and other resources as reference and guidance, helping democratize urbanism to the broader public. 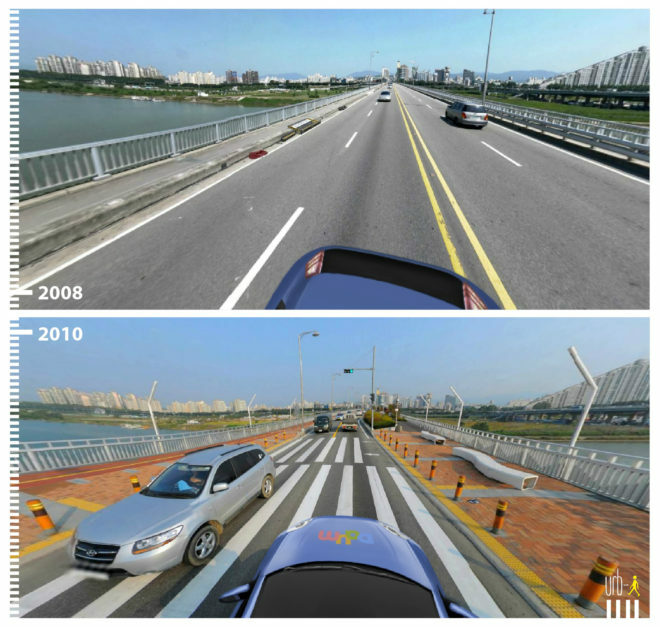 Ideally, new technologies could be developed that could provide the user with an experience of simulating transformations in a proper Street View image. We are now looking for people which can help build this new platform. On the real-life side of urb-i, we hope to continue with the implementation of interventions in cities. Our goal is to continue through the phases of ephemeral to temporary to permanent transformations. We also want to participate in more workshops introducing these ideas to students and inspiring people outside of the urban planning/architecture realm.